With expert help from Nik Sharma of A Brown Table, cooking Indian food at home is going to be less intimidating than you think. Ghee is perhaps one of the most commonly used cooking fats in Indian cooking, and it’s also one of the easiest and simplest ways to use up leftover cream or butter at home. It is a delicious ingredient to work with, a beautifully fragrant fat infused with the flavors of the browned milk solids trapped in cream (or butter). 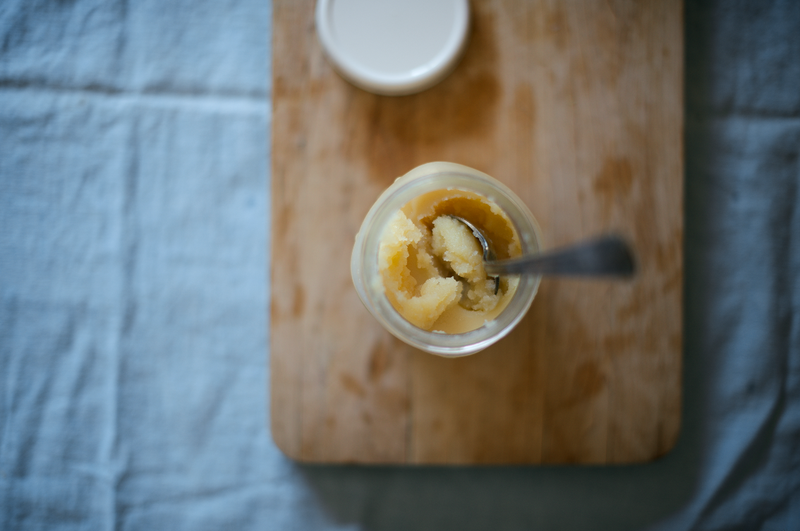 There are many reasons why ghee stands out as a fat to use when cooking. For one, it's casein and lactose free, making it a great source of fat for those with food allergies or on paleo diets. But beyond that, ghee has a unique nutty taste that makes dishes more flavorful than butter does. Though you could substitute butter for ghee when cooking most Indian dishes, the flavor is very different. 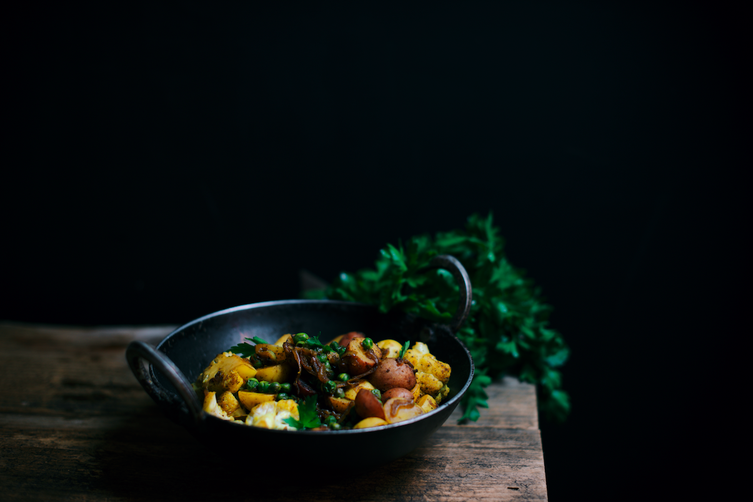 I find that Indian food cooked with butter instead of ghee misses the unique flavor that comes from the browned milk solids. 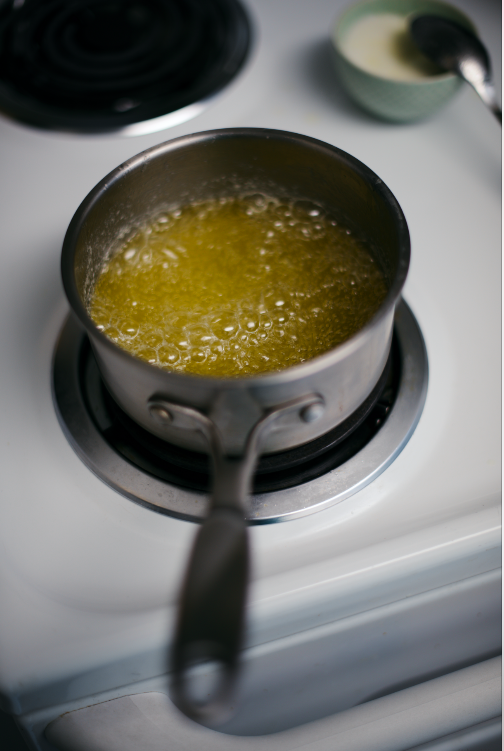 Ghee has a lower water content than butter, which affects not only how food tastes but also how it cooks. Try sautéing onions or vegetables in a little bit of ghee and you will immediately notice a huge difference in aroma and flavor. A few Indian flatbreads also require the addition of a little bit of ghee, which—due to the differences in water and fat content—creates a completely different texture than butter would. 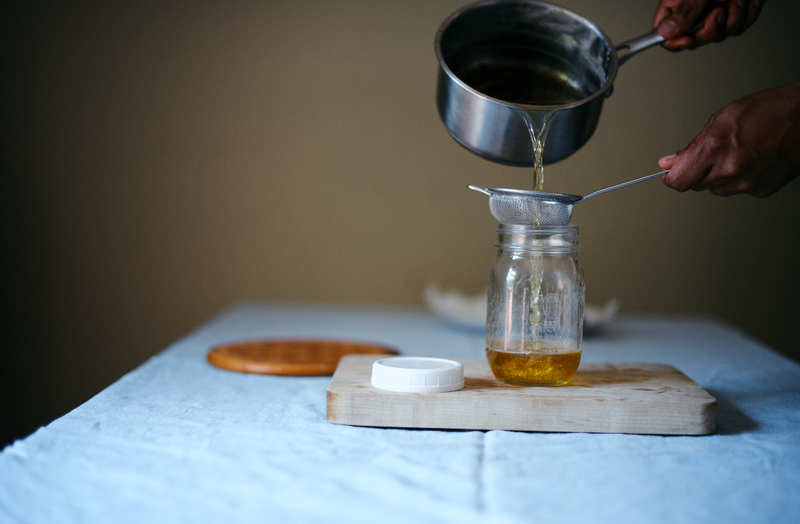 There are a couple of ways to start out when it comes to making ghee. In India, my mom usually makes ghee at home by beginning with full-fat buffalo’s milk. 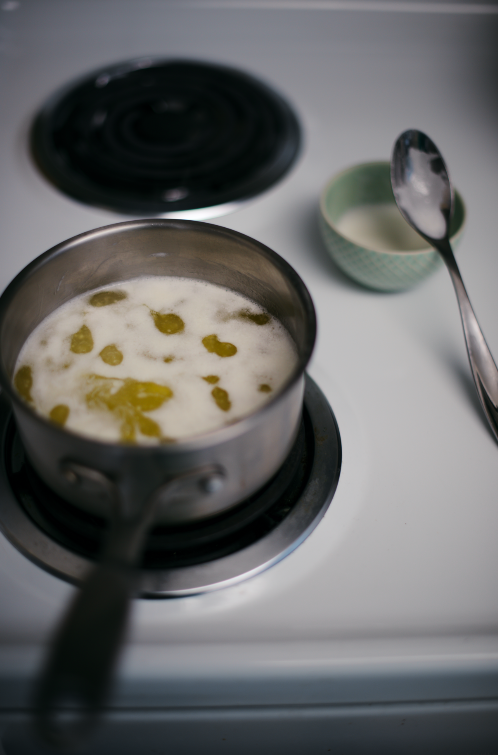 She boils the milk, removes it from the stove, and then let’s it cool completely. Since the milk she uses is non-homogenized, the fat separates easily and cools off into a thick layer of cream that sits on top of the milk which she then skims off and freezes until she is ready to use it. My mom repeats this process a couple of times until she has collected enough cream to turn into butter or ghee. 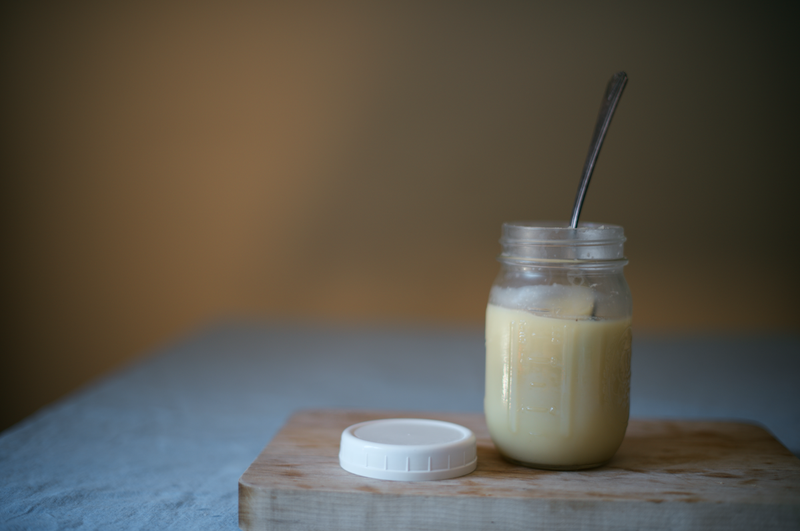 Once she’s ready to make ghee from the cream she’s collected, she thaws it to room temperature and then whisks it until it transitions into butter. Finally, she heats the butter and boils it until all the water has evaporated and a precious pool of golden brown tinted liquid is left behind. This is ghee! I follow the same technique I’ve watched her do a gazillion times, but I start out with unsalted butter made from cow’s milk. Since the milk sold in most U.S. stores is homogenized, it's trickier to collect the cream (but if you can get your hands on non-homogenized milk from a local source, by all means go ahead). Finding buffalo’s milk can be especially hard. 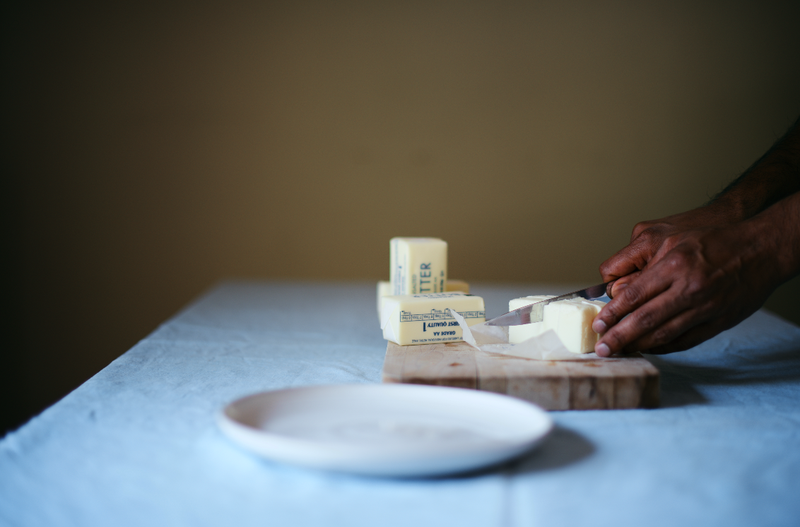 Using butter as my starting material is more convenient and it also saves me time in the kitchen. I then follow the same process that my mom uses. The ghee is ready once all the water has been boiled out of the melted butter. 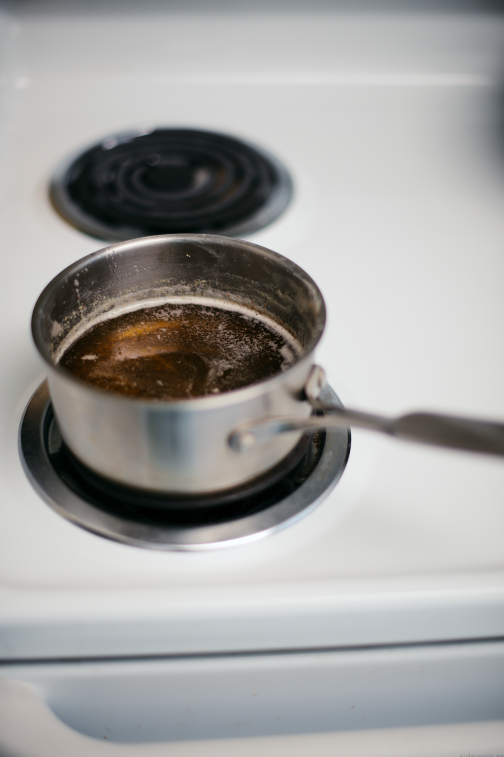 As the water boils, it comes into contact with the hot melted fat in the pan to create a crackling sound that I use to gauge when my ghee is done. As soon as the crackling sounds ceases and the liquid has transitioned to a deep golden-brown color, the ghee is ready to be removed and stored for future use. 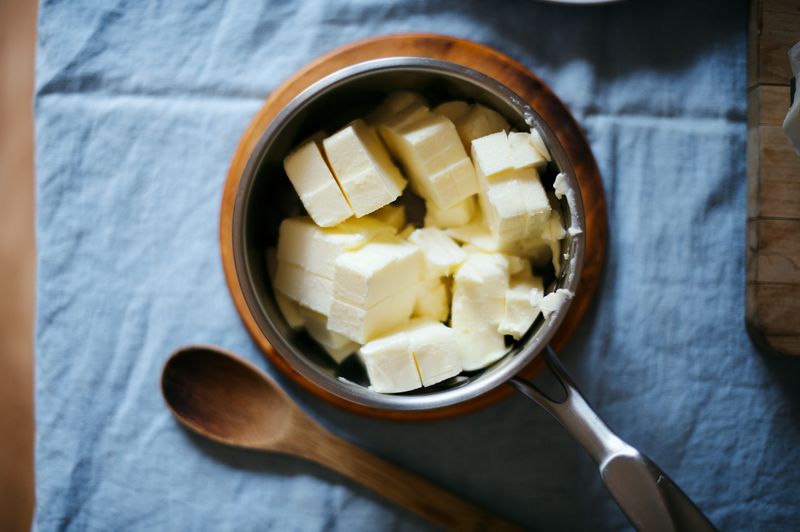 Though you can absolutely make ghee from salted butter, I prefer and recommend using unsalted butter—it will give you much more freedom when it comes to cooking and flavoring your dishes. Use your homemade ghee as you would with any other cooking oil: to sauté vegetables, cook meat, or drizzle over naan, rotis, or plain rice—the options are endless! I save the browned milk solids that are left behind in the saucepan and use them as a seasoning in vegetable dishes or meats and sometimes I even add them to cake batters or brownies for an extra deep and rich nutty flavor. Skim off and discard any foam that rises and collects on the surface of the liquid. 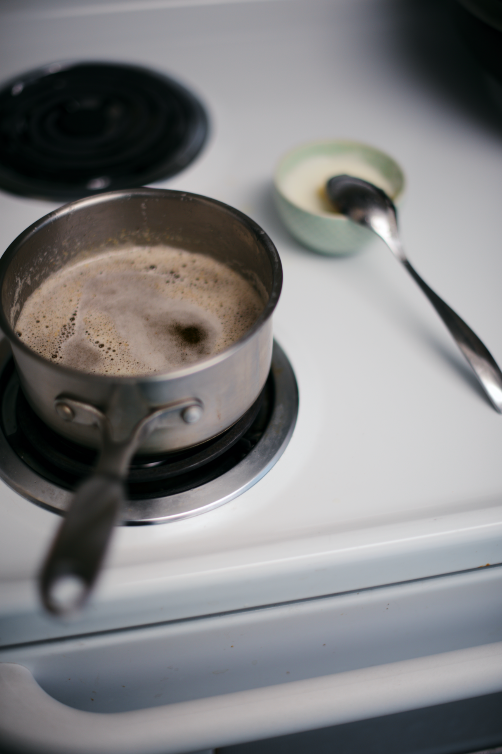 Continue to cook the liquid, stirring occasionally with a spoon, until all the water is boiled out. 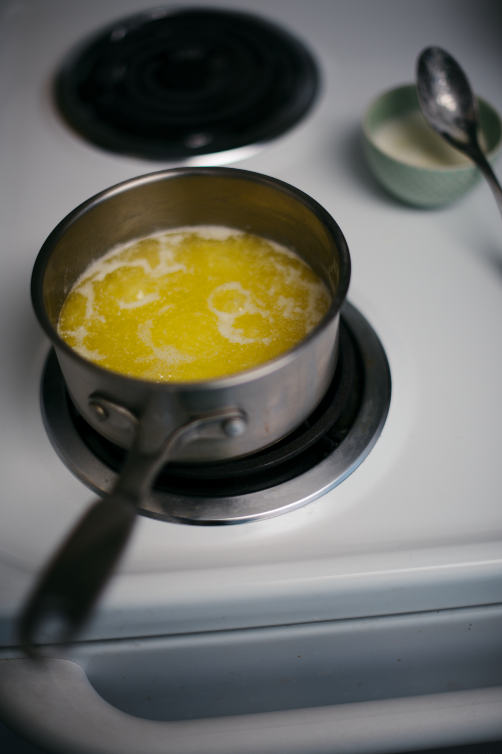 The ghee is ready when the liquid stops making a crackling sound and has transitioned to a deep golden-yellow hue. 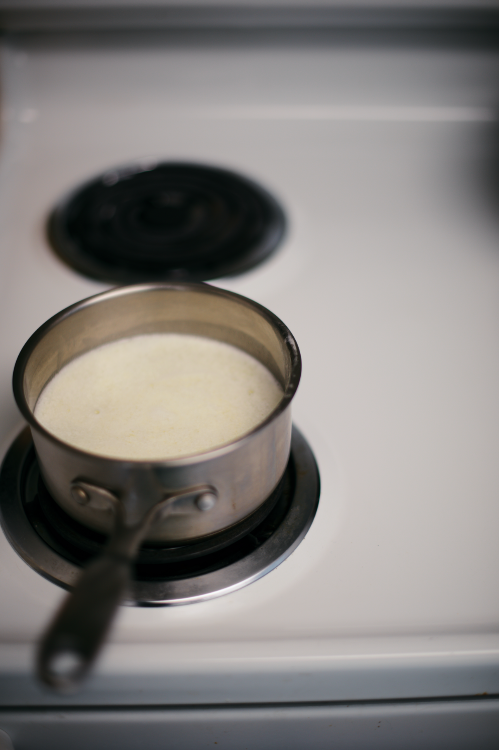 The browned milk solids will have settled to the bottom of the saucepan. Remove the saucepan from the stove and allow to cool for 4 to 5 minutes. 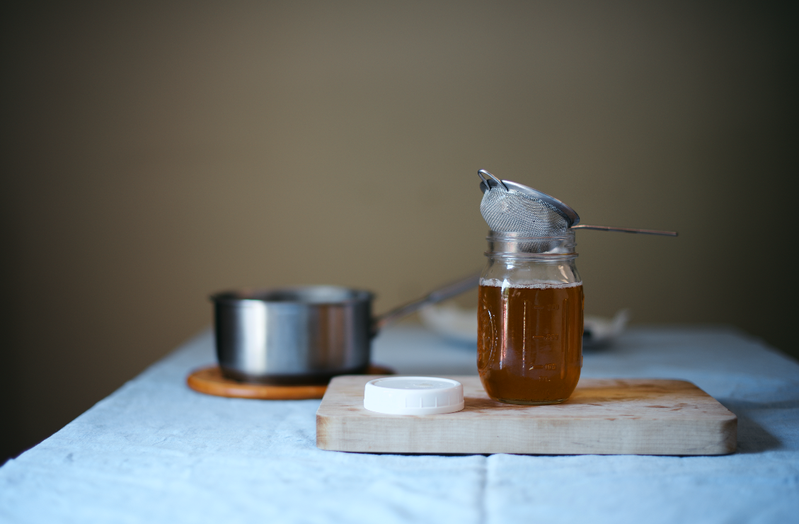 Strain the hot liquid ghee into a clean and dry glass jar by passing it through a fine mesh tea strainer or a funnel lined with a layer of cheesecloth. Seal the jar with a lid and store in a cool, dry place at room temperature or in the refrigerator. I'm a little confused - is there a difference between Ghee and Brown Butter? It seems like they're the same. I see people are straining out the brown bits, but I always let the solids stay in the butter till it's cool, and then mix it so the brown solids stay suspended, which is just something I started doing years ago. P.S. : Loved reading this. 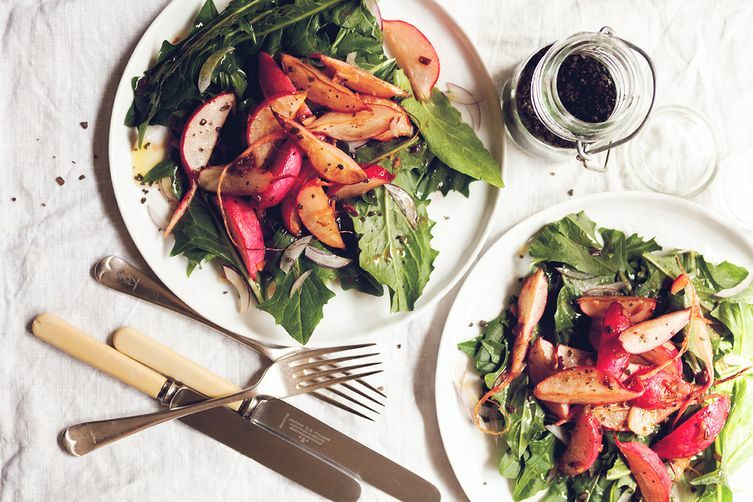 It's so nice to think of people's moms and gramma's cooking... previous generations, other countries... Yeah, this was dreamy to read! This article reminds me of my childhood when my mom made ghee at home using the same method as your mom! :) My mom used to save the brown milk solids and mixed in some granulated sugar and cinnamon and enjoyed this cookie crumbs-like texture dessert/snack. I've never made ghee myself but I may have to give it a try now! I've been making ghee for a few years now. I'd love to try your mom's method starting from milk. Here in Oregon, we can buy raw milk from grass fed cows directly from the farmer. Until then, I really like the oven method using unsalted butter from grass fed cows. My favorites are Kerrygold and Organic Valley. I take a pound of butter and place it in a smallish heavy bottomed pot. I use my 3.5 qt Le Creuset. Put it in a 300f oven. No skimming, no stirring necessary. I let it go until the milk solids are deep brown. It's usually ready when people start asking who's baking cookies. It takes about 70 minutes in my oven. Then I let it sit for just a few minutes and strain it. I never thought to use the milk solids for flavoring, but I love the flavor they have, so I'll start. I usually just snack on them. I think they'd be fabulous on a piece of crusty grilled bread.